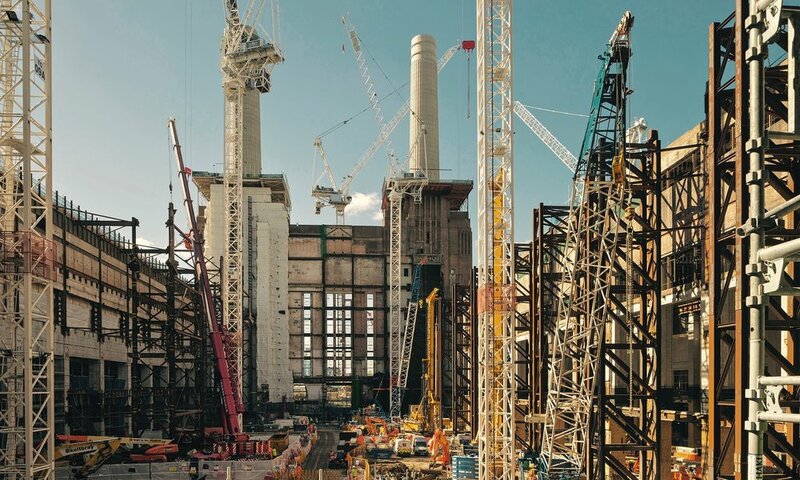 The historic Battersea Power Station is one of the largest urban redevelopment projects in London. Appointed by the piling contractor, A-squared Ltd worked closely with the Principal Contractor and the Engineer to develop practical and economic piling solutions. Due to the complex geological conditions and site constraints, every pile had a unique set of loadings, ground conditions, and access restrictions. The core of the scheme includes the redevelopment of a substantial 34 storey residential tower alongside the construction of a state of the art television studio and HQ facility. The substructure comprises a deep basement, which forms a podium across the broader site footprint. The foundation system has been developed in order to meet the particular serviceability requirements and includes a combination of piled and raft systems, with piles being strategically introduced to mitigate both absolute and differential building settlements. This 26 acre development will feature 1,200 new homes, 58,000 square metres of workspaces, and a 350 room designer hotel. A-squared's appointment extended over various plots of the broader site and included ground investigation optimisation, substructure and foundation analysis and evaluation of soil-structure interaction effects between river walls and building substructure elements. Working closely with the developer, engineer and contractor, A-squared developed an advanced 3D finite element model of the proposed construction sequence, temporary works and permanent works that could provide confidence in the proposed sequence. From the 3D modelling works, A-squared prepared a ground movement assessment and building damage classification, which was able to demonstrate that the proposed construction and development could be carried out without adversely impacting neighbouring property. A-squared were appointed to provide independent review of specialist D&C subcontracts, including diaphragm wall, temporary propping, bearing piles and construction dewatering. The scope of work included assessing compatibility between the various design packages. Identifying gaps between design package interfaces. Identify where risk were being unreasonably transferred to the principal contractor. In instances where gaps or risk could not or, would not, be managed by the subcontractors, A-squared either undertook the design directly or we helped Principal Contractor to mitigate those risks. A-squared were appointed to design a temporary retention system within a congested urban environment. Through early collaboration with the Contractor, we identified that a key driver for the design was employ materials or designs that were not associated with significant lead times due, either as a result of supply chain restrictions, or the need for bespoke offsite fabrication. A unique three-tiered sheet pile system was developed that enabled the Contractor to utilise off-the-shelf construction materials, whilst providing safe access and work space for their operatives. Advanced soil-structure interaction simulations were carried out in order to assess the performance of scheme throughout its construction stages. Particular challenges were posed by the uneven ground levels across the site, resulting in unbalanced earth pressures acting on the basement retaining walls. The design considered the presence of a number of sensitive third party assets in close proximity to the site boundaries. The ground movement and impact assessment process took cognisance of elaborate temporary works conditions as well as the long-term permanent works development scenario.